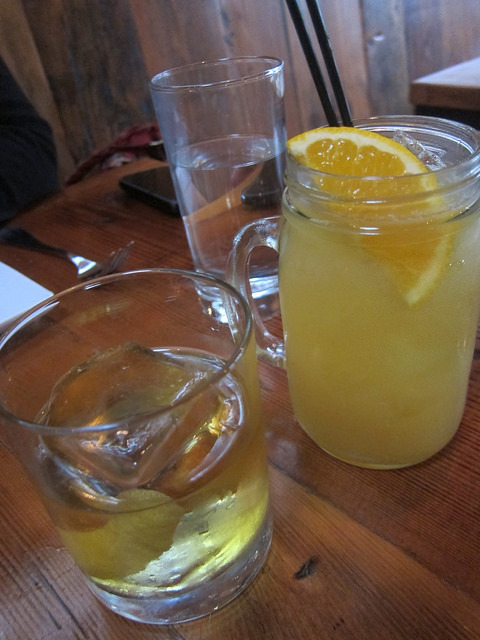 Like any good farm to table restaurant that’s all about seasonal, Old Major changes their menu on the regular. But the one thing that remains constant is the dedication to bringing good porky eats to Denver. The restaurant features high wooden walls and ceilings, cool prints of the city and big windows. We were served complimentary bread and I just loved the pretzel bread. After a long travel day where we spent the day exploring Denver, it was time for cocktails. I was intrigued by the Hello Kitty bitters thinking perhaps it was from a company I knew but these turned out to be house made. With such a meaty menu, I wasn’t surprised to see variations of whiskey drinks featuring whiskey + vermouth + modifier and/or a sweetener. This formula is easily spotted in the Boulevardier version Old Major makes. Called the Kevin Bacon Maple Boulevardier, it features a small batch bourbon and local bacon rim. 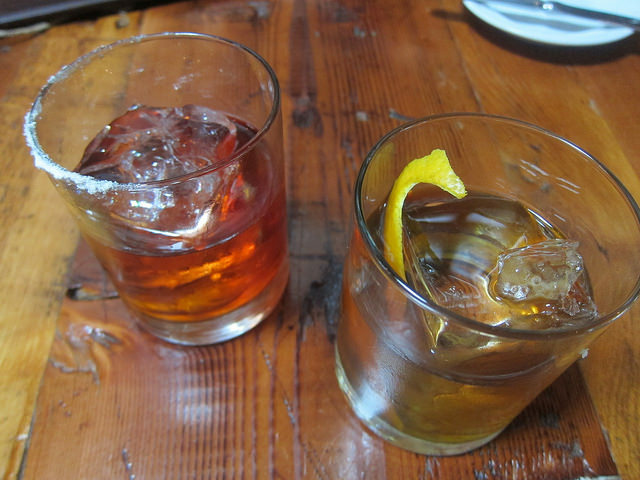 And since it’s a Boulevardier (basically a whiskey Negroni), there was Campari. I thought the Dolin Rouge was a good choice since there was enough sweetness from the maple syrup. 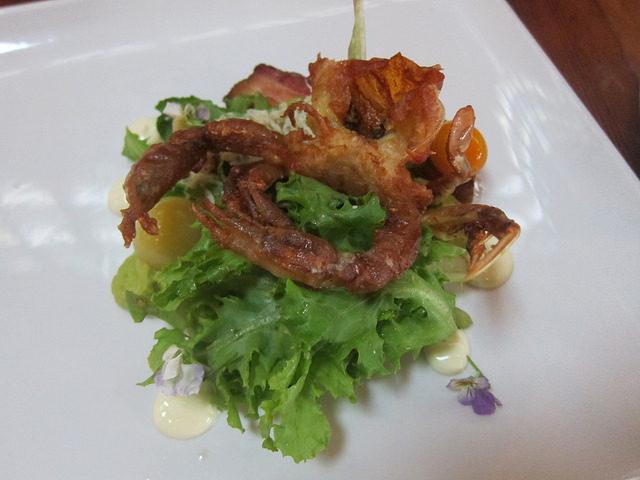 Although listed as a larger plate, I felt the fried soft shell crab was on the smaller side. I did love the fresh greens and charred cherry tomatoes it came with and the Denver Bacon Company bacon. Now if we transferred the whole thing between two slices of toasted, buttered bread, it’d be a wonderful sandwich! 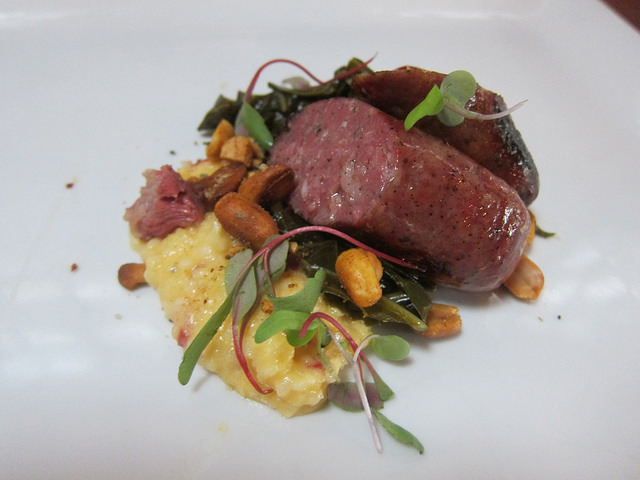 The Old Bay peanuts really makes this smoked country sausage dish. Along with the pimento cheese grits (!!!) and smoked hock collard greens, I’d be happy to see this in a larger format. As a small plate, it was beautifully composed and just enough for two as an appetizer. For our next round of drinks, I decided to get the Bill Brasky since I love Dimmi and was intrigued by the Carpano Bianco vermouth. Although I’ve tasted it before, I haven’t seen it used much in cocktails. It was a very balanced drink and a variation of my favorite type of whiskey cocktail, brown bitter stirred. My friend had the Everything Coming up Millhouse which came in a glass mug. It’s a good long sipper for food pairing. 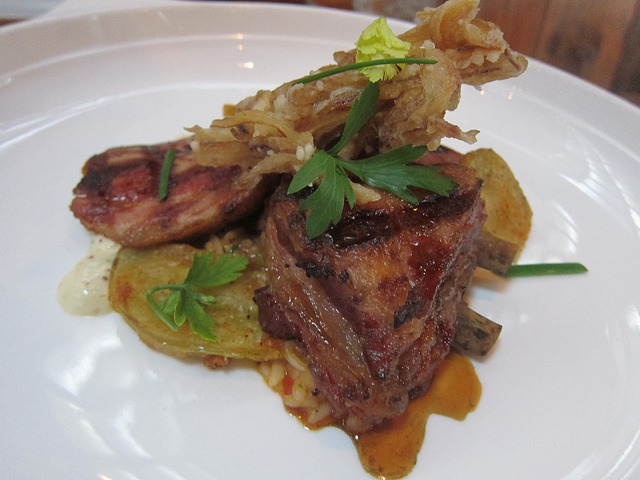 One of the mainstays of the menu is the Nose to Tail plate. While the actual offerings may change, it’s essentially everything edible on a pig. Which… is really everything. On this day, it was braised belly, confit rib, crispy ears and it definitely leaned towards Cajun with Andouille sausage, shrimp jabalaya, fried green tomatoes and remoualade. Stuffed, we skipped dessert in favor of cocktails from nearby Williams and Graham.